A SCHOOL’S international athlete returned to the classroom to talk with the young stars of tomorrow. 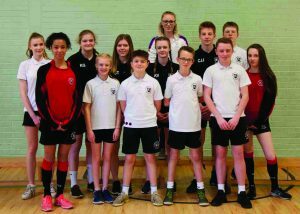 Great Britain international Amy Allcock was visiting The Winston Churchill School, at St John’s, fresh from her world championship exploits when she secured her first global medal. Former student Amy won bronze at the indoor event as part of the British women’s quartet in one of the fastest ever times by a national female quartet.